History of Nova Scotia; Book.2; Part 5; Ch. 12. "The Shannon and the Chesapeake," Part 2. Ch. 12 - The Shannon and the Chesapeake, Part 2. On square-riggers, such as the Shannon and the Chesapeake, sails are hung from yardarms, horizontal sticks on vertical poles (masts). Once dropped by the seamen from the yardarms, the sails would flutter like so much laundry, and continue to do so until tied down at the two lower corners. Thus held, they become stiff to the wind. The tie-down lines at the two lower corners of these square sails, these long pieces of rope, are called sheets. Sheets are part of a sailing ship's running rigging, ropes (though the seaman much prefers the expression "lines") that are handled in order to either haul in or let out the numerous sails above. These lines are essential to sheet in the sails, to stiffen them, to put wind into them and thus to became the driving force of the vessel. If the sheets are let loose (an intentional act when the sailer wishes to loose speed) the affected sails return to being like so much noisy laundry as they shake in the wind. The sailing vessel will loose way (speed through the water) and on loosing way cannot be steered. The vessel is steered by a rudder in the water at the back end or stern of the vessel. A rudder is useless unless it is immersed in a current of water. If a vessel has no way on then she becomes her own free agent, and like a seagull resting on the water, will want, suddenly, and notwithstanding a sailor's wishes to the contrary, to change her direction. The direction a stopped vessel will take is predictable. Because of its dynamic shape, she will come up into the wind. She will point her nose, or bow, up into the wind. Unless some immediate corrective measures are taken, the sailing vessel will start to go backwards, stern first. And so we see that there are critical lines called sheets, part of the running rigging of a sailing vessel. A set sail on a sailing vessel, while underway, must be tight and tied down. Now, one can be certain that all of the Chesapeake's sheets were tight and tied down as she came into battle with the Shannon. What happened was that certain of the Shannon's shots -- much to her good fortune, and much to the misfortune of the Chesapeake -- cut certain of the Chesapeake's sheets.1 So, immediately the sheets let go -- and it must have been quite a few all at once - a number of the Chesapeake's sails immediately went into their laundry like state of just shaking in the wind. 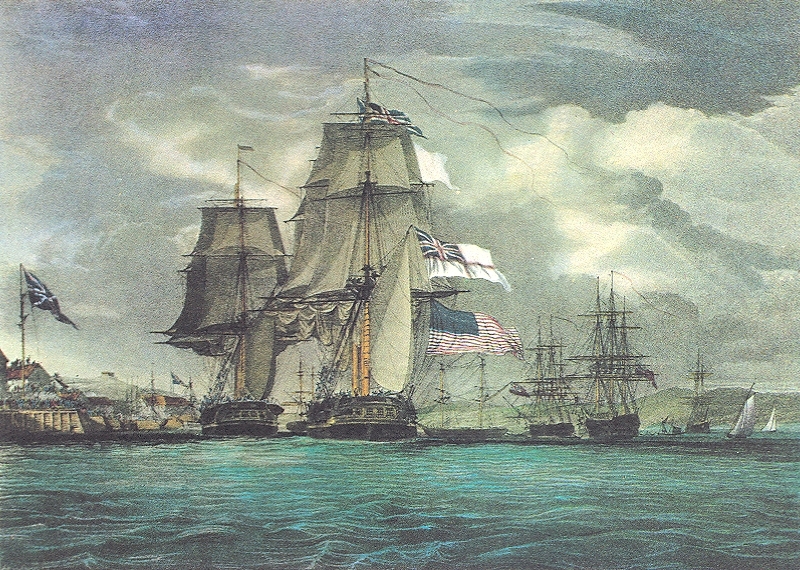 Suddenly and uncontrollably she swung to her right seeking to put her nose into the wind, which, of course, would have been no great problem were she out for a pleasure sail, but she had a vessel broadside and downwind of her, a British Man of War, ready to rake with killing shot from stem to stern. Or rather, from stern to stem, which is precisely what the Shannon did. It should be pointed out that the Captain and his first officers are usually clustered together at the stern, the place where the steering wheel is, the command center, the quarterdeck. So it was, that many of the Chesapeake's officers were splattered to their deaths as the Shannon's iron shot carried away everything on the Chesapeake's quarter deck. "The battle at this moment was decided. "2 "All in the Wind," her sails "a'shivering," the Chesapeake lost her command. Seeing the Chesapeake in such trouble encouraged Broke to do what he could to come alongside and board her. He did not have to do much, for by now the Chesapeake was coming stern-first and soon fell foul of the Shannon. Running forward and seeing that the Americans were quitting their guns, Captain Broke seized the moment and ordered the ships lashed together, not something the Americans were very keen on, for the two British seaman doing the lashing, one being the boatswain, William Stevens, were mortally wounded with sabre cuts and by musketry. All of this happened within twelve minutes of the first cannon shot. Also within this first twelve minutes "Captain Broke, at the head of not more that twenty men, stepped from the rail of the waist-hammock netting to the muzzle of the after-carronade of the Chesapeake, and sprang from thence upon her quarterdeck. "3 Captain Lawrence was mortally wounded by fire from Shannon's fore-top and had been carried below before boarding commenced. 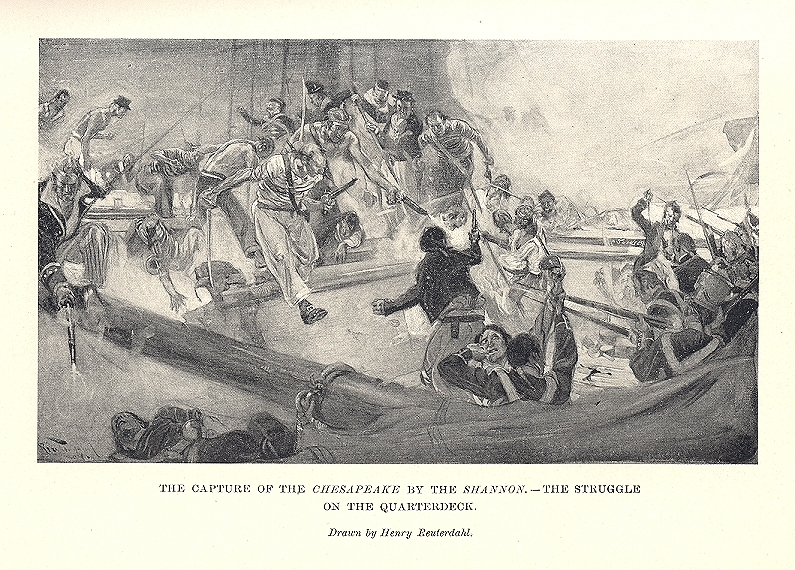 While forward of the quarterdeck there were Americans, none were there to greet the Shannon's boarding party. The Chesapeake's deck-men were just recovering from the bad raking they had received. Broke lost no time. He and his men advanced forward along the decks, and with this advance more British reinforcements spilled onto the decks of the Chesapeake. The Americans were hesitant, and understandably so. They had just experienced the sudden desolation of their surroundings. What had been an organized scene with things in control had just been concussed into one covered in splintered wood and blood. But they did not hesitate for long, and, indeed, the marksmen in the tops hardly hesitated at all. The British boarding party was being fired upon by the American marksmen lodged in the mast-tops of the Chesapeake. Marksmen were positioned high up in the masts on both ships. They were not only the best men with muskets, but they were agile and able to scamper from one spot along the yardarm to the next spot. Indeed, it was intended that they should at the right time make the jump from their yardarm to the enemy's yardarm. In these important first minutes the British "cross-tree marksmen" took to their backup job with gusto. Headed by physically powerful young midshipmen they swung over like flying monkeys to surprise and dislodge the musket-loading Americans; the tops of the Chesapeake were soon cleared. William Smith was one of these midshipmen. We shall shortly be referring to him once again. Years ago, when I was young and going to university, I was a part-time midshipman in the Canadian Navy. I recall receiving from one of the seasoned navy-men that one of the worst things a navy man could do was to foul up the business of raising the flag.5 The raising of a flag is always accompanied with much ceremony, or, at least, as much as might be allowed in the circumstances. A flag or a pennant when raised in a certain position always has a meaning to the sailors aboard. On a navy ship the raising of the country's flag is done every morning; it is lowered every evening. One of the proudest moments for fighting sailors is when -- and it is to be done as immediately it can be done -- their flag is raised on a boarded enemy ship. 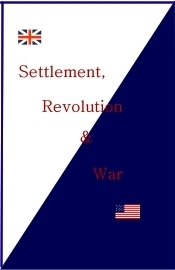 When a fighting man sees his country's flag being raised over the disputed territory, it spurs him on to greater efforts; it has the counter effect on the other side. I did not really appreciate that back then, when I was a midshipman, and it was to be a long time after my naval experience before I heard about the story of Lieutenant Watt and his men, and a most unfortunate mistake of theirs. Lieutenant G. T. L. Watt was one of the first men to board the Chesapeake immediately at the heels of Captain Broke. He soon perceived that he and his brave comrades had the upper-hand over the fighting men of the Chesapeake. Within a quarter of an hour after it started with resounding cannon, all was quiet except for the groans of the wounded seamen. 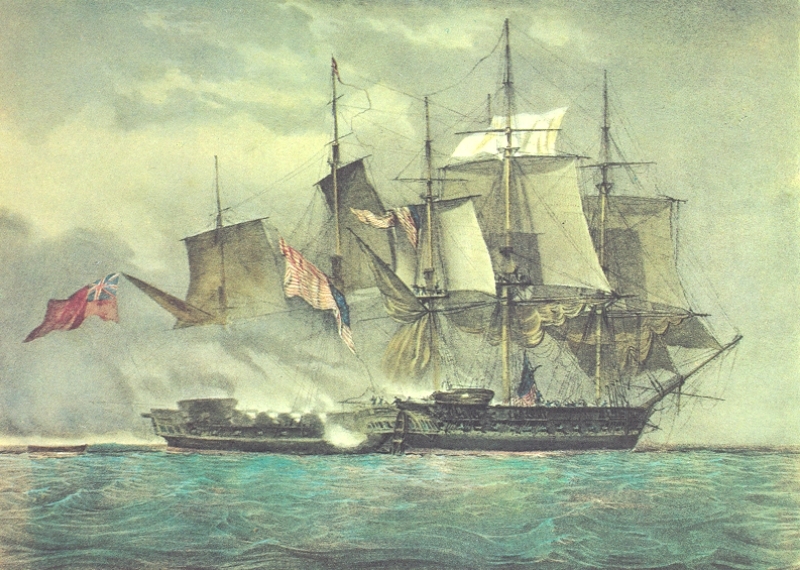 The Shannon and the Chesapeake had only exchanged twelve minutes' worth of cannon fire. Before the end of that twelve minutes, Captain Broke and his men were on the deck of the Chesapeake. Four minutes later all fighting ceased and the Chesapeake was the Shannon's prize. Not long after that Captain Broke fainted from loss of blood, and he was soon rowed over to the Shannon in the jolly-boat. "The Shannon, in the company of her captive the Chesapeake, came proudly up Halifax harbour." Sufficient repairs having been soon effected, the two combatants, now at peace under one command12, set off to sea. The two ships sailed together northeast into friendly waters. Five days later, on June 6th, signals were received and repeated. A gun went off on Citadel Hill at Halifax and flags were raised to indicate that there were two warships in the offing. It was Sunday morning and many of the Halifax residents were in their finest, attending services at St. Paul's. The news spread fast and a crowd soon gathered on the harbour front. The crews of several British warships already in the harbour mounted the ratlines and the crosstrees of the towering masts. Loud cheers went up from the crews of the ships and from the crowds lining the shore. The Shannon came proudly up Halifax harbour. She had in company one of "the far-famed frigates." The Shannon brought the Chesapeake home as a prize-of-war. 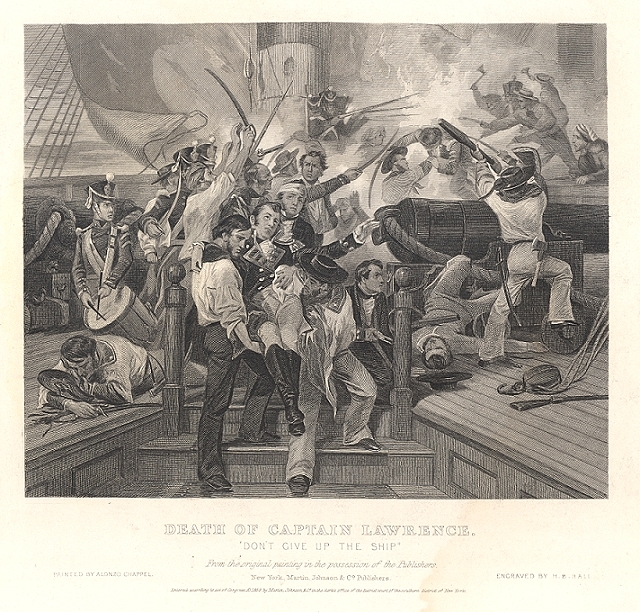 Suffering from his serious wounds in a cot while his ship was brought to Halifax, Captain Lawrence lingered for four days and died a day before Halifax was reached. The American crew was as well treated as the British, with the wounded being cared for in the naval hospital. On June 25th, an American ship, the Frederick Augustus carried a number of sick and wounded prisoners to Boston.18 On August 10th, the American Brig Henry came in under a white flag. She came up from Boston as a cartel requested it be allowed to take the body of Captain Lawrence19 late of the Chesapeake. Within days, the Henry sailed for Boston with the body of their hero together with a number of prisoners.20 Though it seems the sick and the wounded were sent back to their homes within a few weeks, Melville Island Prison21 at Halifax was to keep the healthier ones for awhile. They were processed and a determination was made whether the individual was a British seaman (read "deserter"), or, if an American, was he one that had been previously captured and released on his undertaking not to bear arms for the duration. One hundred and one of these American prisoners22 fitted into one of these two categories. They were put aboard the two war vessels which were en flute, being the Regulus23 (meant for 44 guns) and the Melpomene (meant for 38 guns). On September 5th, the two left for England.24 The very same day, incidently, that the Shannon, Captain Teahouse, set out on a cruise.25 For the Shannon it was a short cruise, for we see that on October 4th, the Shannon sailed with the fleet for England. Captain Broke, still suffering from his wounds, was back aboard his Shannon headed for home and full of glory; they arrived at Portsmouth on the 2nd of November.